"We won't allow the actions of a few men to undermine the more than five decades of leadership this fraternity has demonstrated in the fight for racial equality and diversity on our college campuses,"
- Sig Ep CEO Brian C. Warren. The Mississippi Alpha chapter of Sigma Phi Epsilon at Ole Miss has been indefinitely suspended by its national headquarters, and three Ole Miss freshmen from Georgia have been kicked out of the fraternity after refusing to talk to police about a noose and Georgia flag found on the James Meredith statue on campus. "Sig Ep has indefinitely suspended its University of Mississippi Chapter and asked that the chapter cease all operations," said a statement issued by the fraternity on Friday. "The fraternity staff is working with chapter and alumni-volunteer leadership to conduct an internal investigation. The fraternity intends to conduct a comprehensive review of the membership to ensure members' values align with those espoused by the fraternity." "We won't allow the actions of a few men to undermine the more than five decades of leadership this fraternity has demonstrated in the fight for racial equality and diversity on our college campuses," said Sig Ep CEO Brian C. Warren. The fraternity expressed shock and embarrassment at the behavior of the three. "It is embarrassing that these men had previously identified with our Fraternity. Sig Ep as a national Fraternity has championed racial equality and issues on diversity since 1959 when it became the first national fraternity to invite members of all races, creeds and religions to join its membership," said Warren. "For this to occur in 2014 is an insult to the legacy of James Meredith, The University of Mississippi community, and the Sig Ep alumni who fought for racial equality in the late 1950s." 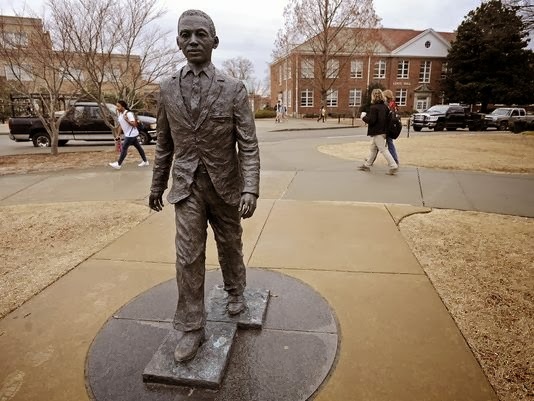 The three were declining through their attorneys late Thursday to be questioned by university police regarding the vandalism Sunday morning of the University of Mississippi's James Meredith statue, according to the university chief of police, Calvin Sellers. Two of the students were those being sought by university police, but all three names had been prominent in the investigation, according to Sellers. He said the attorneys declined to make their clients available for questioning without an arrest warrant. The university is satisfied that the three students under investigation are responsible for the statue's desecration, Blanton said. "Both federal and local authorities have done a very tough and thorough investigation and interviewed a lot of people to gather information," he said. The FBI said Friday it planned to expand the investigation for potential violations of federal law. The statue commemorates Meredith's 1962 entrance into Ole Miss, which marked the integration of the university. Meredith has declined to comment on the vandalism. Therese Apel writes for the Clarion-Ledger in Jackson, Miss.